Australia has published NAB Business Confidence and the US will release JOLTs Job Openings. 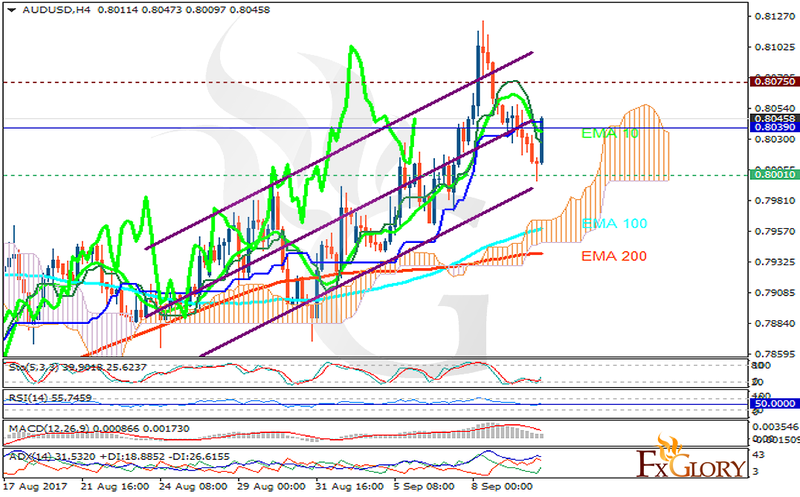 The support rests at 0.80010 with resistance at 0.80750 which the weekly pivot point at 0.80390 is located in between the lines. The EMA of 10 is moving with bearish bias but it is above the EMA of 200 and the EMA of 100. The RSI is moving on the 50 level, the MACD indicator is in positive territory and the Stochastic is showing upward momentum. The ADX is showing sell signals. The price is in the Ichimoku Cloud and above the Chinkou Span. The Tenkan-sen is showing a downward trend while the Kijun-sen is showing a horizontal trend. The support area seems to be too strong to be broken therefore buyers can target 0.81.